This book, a collaborative effort from several esteemed authors, offers general readers and professionals alike straightforward, step-by-step exercises for learning and putting into practice the four core DBT skills: mindfulness, interpersonal effectiveness, emotion regulation, and distress tolerance. From the Back Cover A Clear and Effective Approach to Learning DBT Skills First developed for treating borderline personality disorder, dialectical behavior therapy (DBT) has proven effective as treatment for a range of other mental health problems, especially for those characterized by overwhelming emotions. Research shows that DBT can improve your ability to handle distress without losing control and acting destructively. In order to make use of these techniques, you need to build skills in four key areas-distress tolerance, mindfulness, emotion regulation, and interpersonal effectiveness. 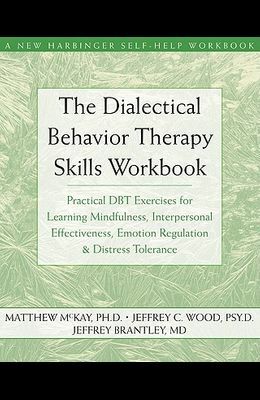 The Dialectical Behavior Therapy Skills Workbook, a collaborative effort from three esteemed authors, offers straightforward, step-by-step exercises for learning these concepts and putting them to work for real and lasting change. Start by working on the introductory exercises and, after making progress, move on to the advanced-skills chapters. Whether you are a professional or a general reader, whether you use this book to support work done in therapy or as the basis for self-help, you'll benefit from this clear and practical guide to better managing your emotions.